This weekend is the 22nd Annual Great Backyard Bird Count, four days when, world-wide, people peer through binoculars and add apps to their phones (speaking from personal habit) to help them identify what birds are at their feeders or watering troughs from February 16-18, 2019. I can hear European starlings above our bathroom ceiling, so we started the count right off with that species. We really need to fix the cover on that vent. Saturday morning, two Debs, one Maya, one Terry and one Mandy joined in The Quarry Farm count. At 8:08 a.m. we headed across the footbridge to listen and look for what birds would venture out with us into the cold. Not many, as it turned out. Red-bellied woodpeckers hammered in the north along Riley Creek. Horned larks chimed in the field. White-breasted nuthatches scolded. We saw or heard a downy woodpecker, two goldfinches, robins, a male cardinal, bluejays and two Canada geese. The air was heavy with impending snow. We kept out toes moving and warm by exploring for nonfeathered treasures. There were tracks frozen in the floodplain, reminders of floodwaters that covered it earlier in the week. Fungi bracketed trees and downed limbs. Puddles were flash-frozen in rings as waters receded. Mandy spotted a cocoon of some kind that we have yet to identify but is probably this. And Laura was thrilled to see that the Indian hemp, also commonly called dogbane, has spread in the back 10. The promised snow falls in icy pellets. A crow flew over this morning, calling as he scouted, his caws echoing in the cold sky. There isn’t much movement otherwise. I sit at the sewing machine, securing goat coat straps in place. S’more ditched his yesterday during an hour or two of warm sun. Now he is piled under straw in Sophie’s barn. From my perch at the sewing machine, I can watch for birds. The winter is frighteningly in need of visitors. We’ll listen for owls tonight. Until then, the hot chocolate and tea are warm and plentiful for watching whomever flies. 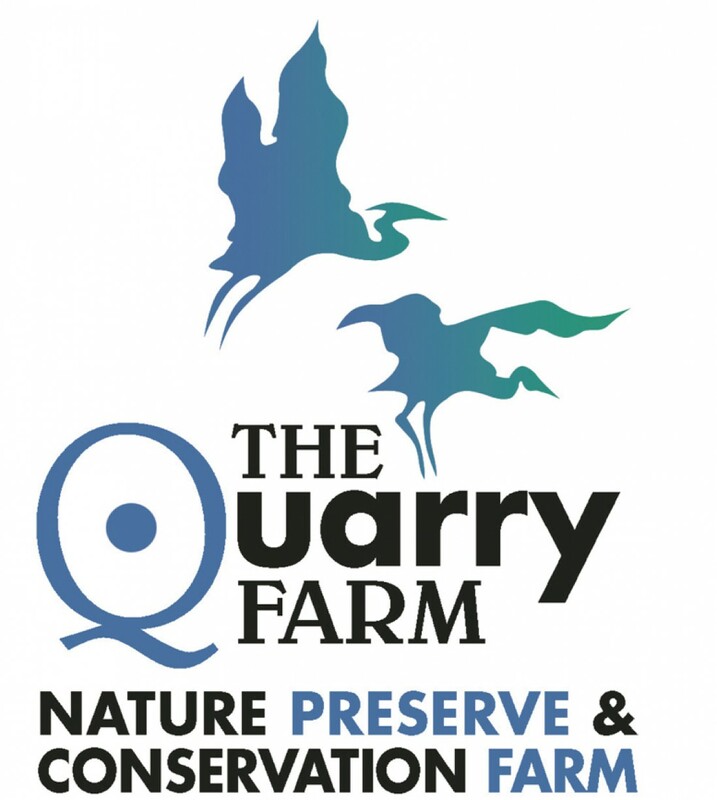 All The Quarry Farm news that is fit to print, or at least all the news that we could fit on an 11″ x 17″ piece of piece of paper printed on both sides, is being printed as we speak. But don’t wait for hard copy. Click on the cover here and the electronic version right now. There was a chair in my grandparents’ house. It was a nondescript stool with a square burgundy seat mounted on four iron legs. It was the kind that you could spin in circles. You could push off with your feet or lay face down across it and turn, walking the circle with fingertips to the floor. I spent a lot of childhood in that house. One warm summer evening, while Grandpa was in the milkhouse and Gran was making Jersey milkshakes for after chores, I sat on that stool and watched Silent Running, a 1972 environmentally-themed American post-apocalyptic science fiction film starring Bruce Dern. I sobbed as Earth’s last forest traveled out of reach. As a teen, I sat in Gran’s kitchen and bit my nails while she talked with a caller at the back door. The visitor wanted to buy the property located a mile east of the farm, the 50 acres of woods and stream where Grandpa pastured senior calves in summer. I knew they could use the funds from a sale. I was so afraid that this last forest would be gone. “No thank you. We don’t wish to sell it,” she said to this offer and to many others. Carl and Joyce Seitz were my grandparents. My grandfather was a dreamer; a handsome rake who was a lover of books. He was a college graduate, but the farm fell to him while the country was dealing with depression and world war. He would drive a tractor and whistle. My grandmother, a college grad, too, was a stylish beauty who became a farmer’s wife. They raised eight children in that farmhouse. In the warm months, the family sometimes picnicked along the creek that flowed through that 50 acres to the east. In winter, they skated on the old flooded stone quarry there. We lost Grandpa 25 years ago. Today, we lost Gran. Because they both valued the black walnut, maple and oak trees that grow here, the dogtooth violets, mayapples, bloodroot and spring beauties on the ridge and in the floodplain–because they were educators and dreamers–The Quarry Farm is still here. During a trip home from university, one of my uncles looked out the kitchen window in time to see Gran hand-feeding a skunk. Two weeks ago, I took Sebastian the Skunk to visit her. Gran would have celebrated 101 years in November, but she was sharp as a tack and delighted in ‘Bastian as well as what we do here. Chryssy the Cat climbs on my lap now. She shared that farmhouse, the one where we all climbed trees, made mud pies, collected fireflies in a jar, photographed migrating monarchs in the trees, and where our Gran worked art in her kitchen while teaching us to reach for the whole world outside. Much as I tried, I couldn’t leave this photo to its own devices. Buddy was indeed yawning, not braying the classic “hee haw.” Donkeys don’t, at least the two here, don’t. They “hee-hee-hee” and “ho-o-o-o-nk” and blow raspberries, but declare nothing for Buck and Roy to play along with. Sunday morning, as I filled the water pans, Buddy followed me to make sure no carrots lurked in my pockets. I saw his lower lip begin to tremble and readied the camera just in case a toothy grin was on its way.. There is no better cure for a bad case of the Mondays than a brisk walk in the open air. 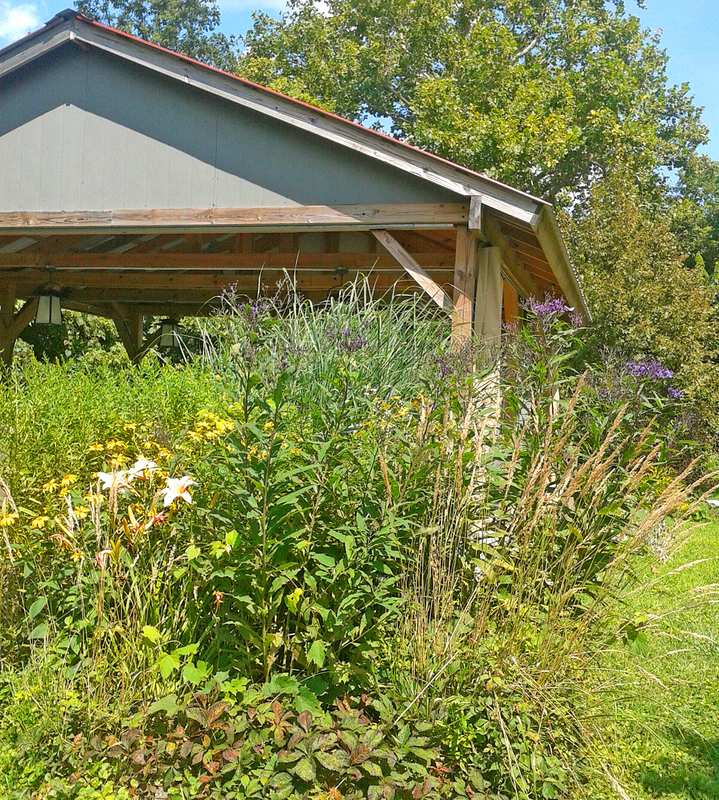 If your feet take you beyond the water cooler and out of doors to a concrete sidewalk, perhaps this virtual walk in The Quarry Farm butterfly gardens will transport you beyond your August Ohio heat island. Late summer in Northwest Ohio means sweat that never dries, elephant-eye-high corn, even this year after months of heavy June and July rain, and the golden greens of mature plant leaves, the rich amethysts of ironweed and Joe Pye and the hot reds, oranges and burgundies of lilies, cosmos, Susans, zinnia and echinacea. The Gardener would likely list many more flora, but since she’s otherwise occupied in the gardens themselves, you are stuck with those plants that I can identify around the Seitz Family Pavilion. Lucky for all of us, she always carries her phone. 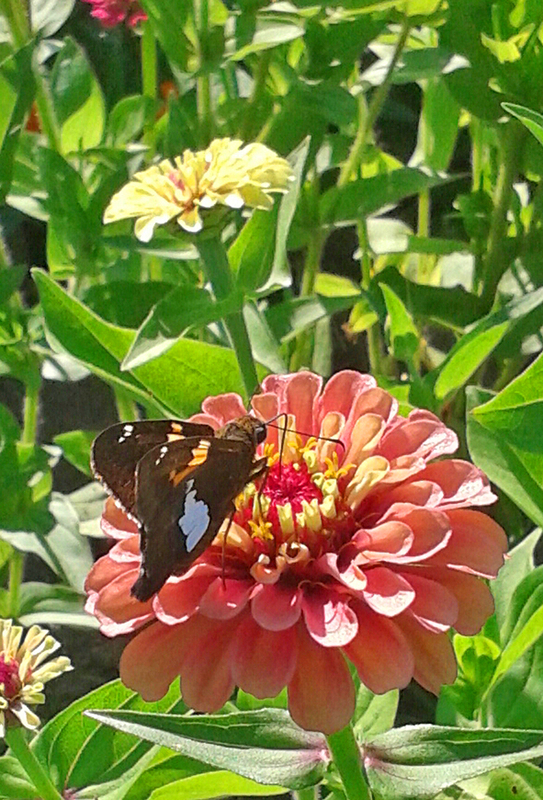 And because she does, she took photographs of the better-late-than-never butterflies that are moving from flower to flower. Better still, she took video. 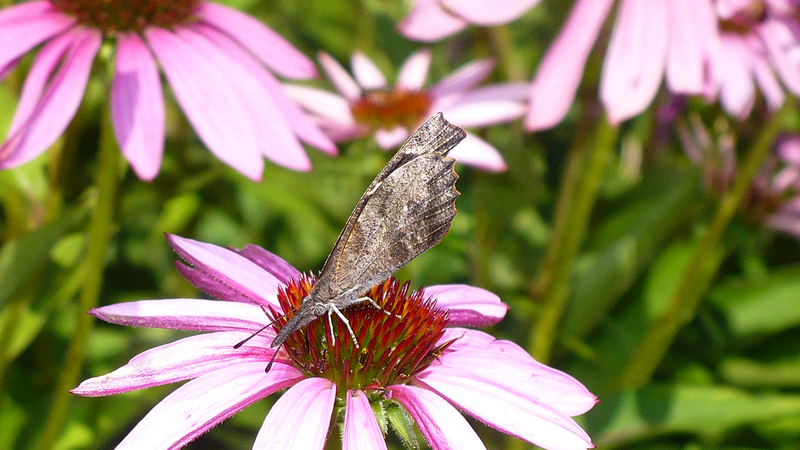 So, find a park bench or an open window and take a virtual butterfly walk in the warm August sunshine. There is breeze today to keep the virtual mosquitoes at bay. 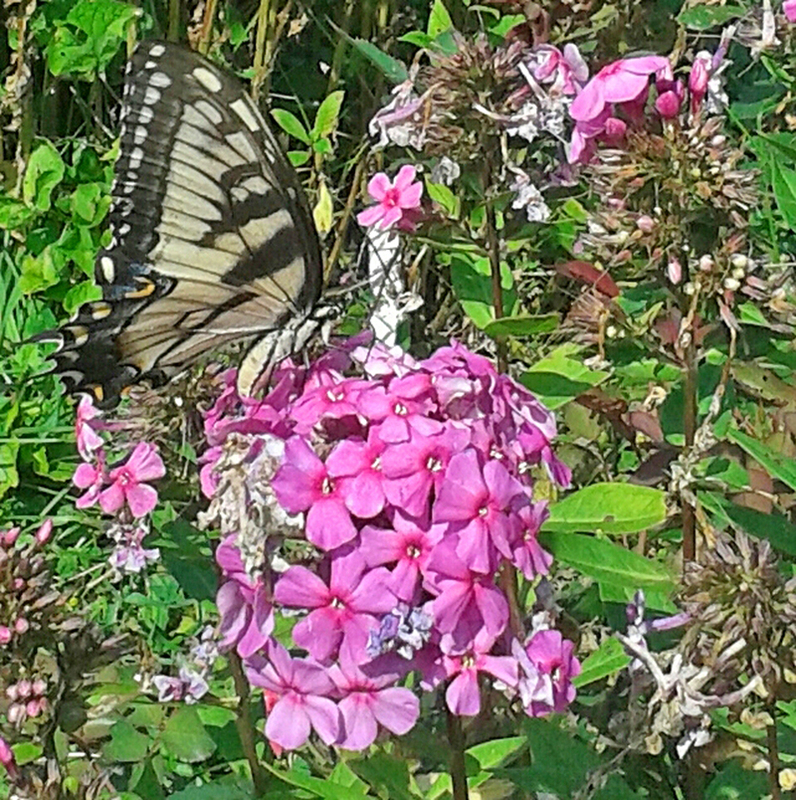 And what better image to leave you with, for today, than a giant swallowtail doing its level Lepidopteran best to pollinate every plant in the north bed? Now go back to work, full in the knowledge that there are still butterflies in the world. We’re six days and counting with no rain. The morass is drying and the butterflies and other pollinators have landed, flitted, and flown in greater numbers than we have seen in these parts yet this year. 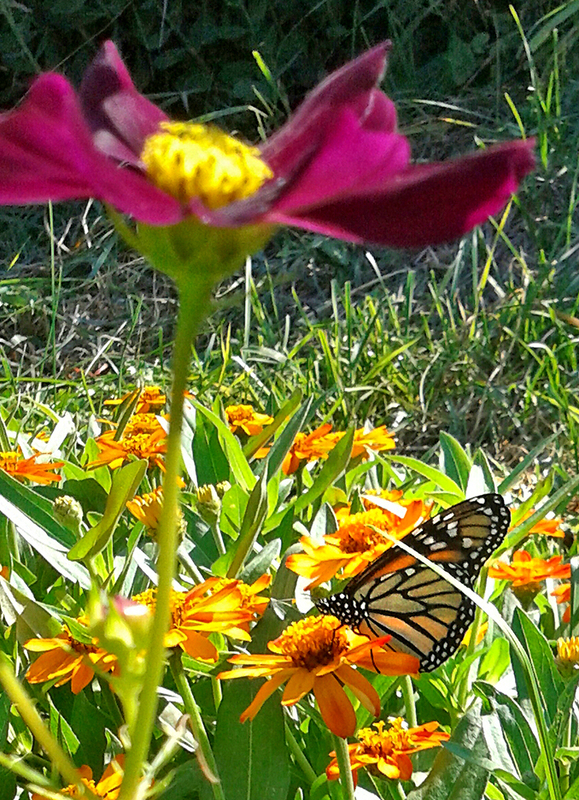 Before summer’s end, I may need all 10 fingers to count monarch butterflies. The milkweed keeps sending out its rich fragrance. We can hope. In between butterfly counts, we loaded a crated Carlton into the car and took him down to the Veterinary Medical Center at Ohio State University. What started out as a solid mass that wrapped under his right foreleg had settled into three abscesses. Fearing a pernicious parasite, we made the trip that we’ve made twice now with Marsh the Nigerian dwarf goat. I love that place — if not the reason for going, but for the experience. 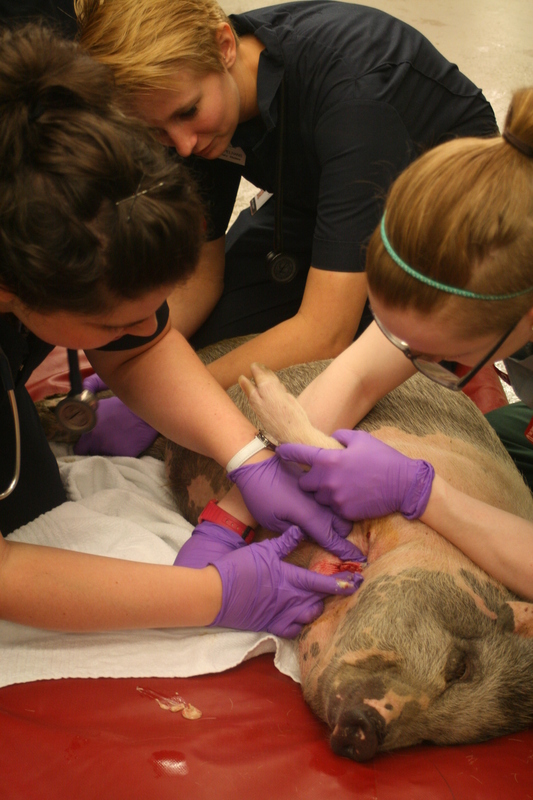 The veterinary students and faculty and are curious, kind and thorough. On Thursday, with a dozen or so students gathered around, Erin “won” the opportunity to lance the most problematic abscess. It was truly spectacular, so productive as to elicit a burst of, “Ah-ohhhhs!” and applause. Dr. MacKay announced, “I don’t trust anyone who doesn’t appreciate a good abscess.” That right there is a bumper sticker in the making. On Friday, more color, of a very different kind, arrived here on The Quarry Farm. 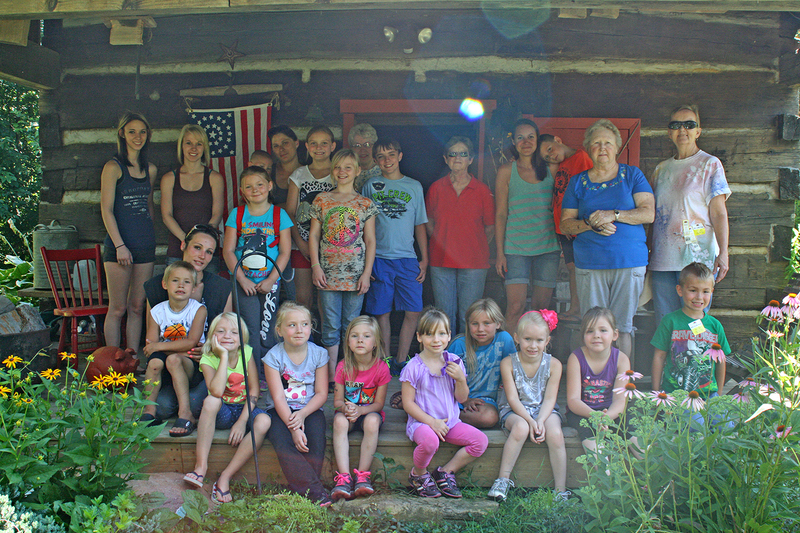 The Continental Junior Gardeners visited for the fourth year. There were many new faces this year, although some came into focus as we realized they were the siblings of children who visited in the past. 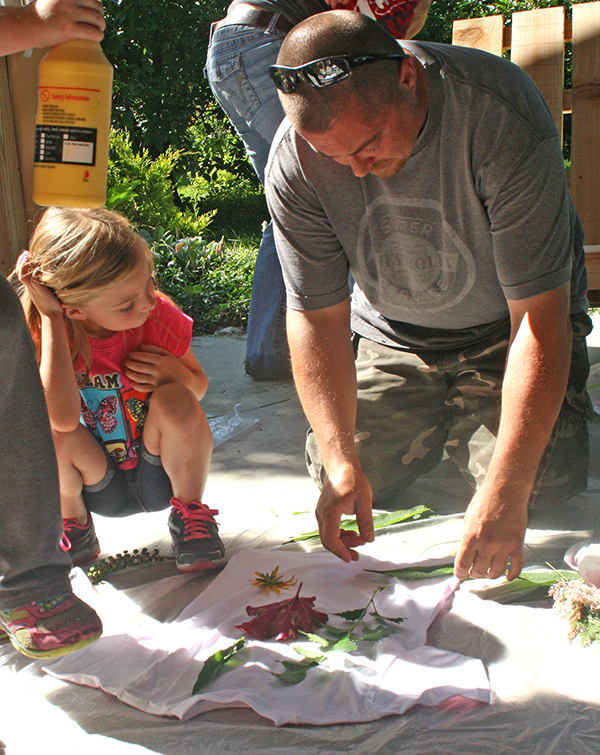 They gathered leaves and arranged them on white t-shirts, then sprayed diluted acrylic paints on the shirts to create one-of-a-kind designs. Leader Charlene Finch said they will wear them in the Continental Fall Festival parade in September. After lemonade and cookies, they walked through the butterfly gardens and visited the farm animal sanctuary. The turkeys claimed the group as their own and gentle giant goat Mr. Bill smiled for several cameras. Before they left us for another year, all but one camera-shy dad posed on the red Fox Cabin front porch for their annual portrait. The sun continues to shine today. Damselflies and dragonflies are on the move, lessening the hum of mosquitoes bred in the recent floods. 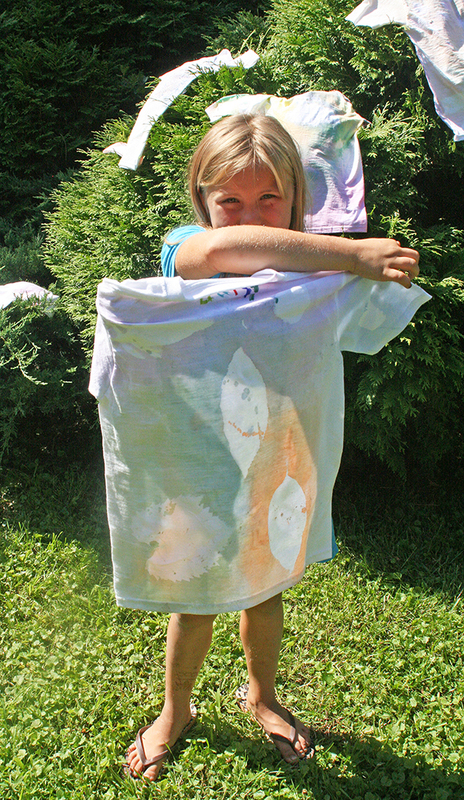 With paint left in the spray bottles, I think a few more t-shirts will be made this afternoon. Pick up a t-shirt of your own and come on by around 3 p.m.
Can’t promise there will be any cookies left, but there are butterflies and a much happier pig next door.